Robert E. "Mort" Cooper, Sr. Celebrating the life of Robert E. "Mort" Cooper, Sr.
Obituary for Robert E. "Mort" Cooper, Sr.
Robert E. "Mort" Cooper, Sr., 90, of 339 E. Jamestown Rd., Greenville, (West Salem Twp. ), PA, formerly of E. Ridge Ave. in Greenville and Quartermile Rd. 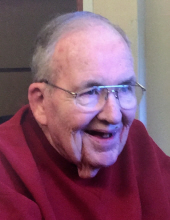 in Hempfield Twp., passed away at 8:00 pm on Monday, February 4, 2019 at St. Paul's in Greenville. Mort was born in Greenville, PA on April 29, 1928 to the late, Lawrence J. and Viola M. (Hittle) Cooper. He was a 1945 graduate of Penn High School and 1949 graduate of Thiel College with a Bachelor of Science degree in economics. Mort was in the U.S. Army during the Korean War, where he served as acting Sergeant and was discharged as a Corporal. He continued to serve six years in the reserves. Mort was a lumber salesman working for Greenville Lumber, manager at Moss Lumber in Andover, OH, and retired from U.S. Plywood Corporation in Youngstown, OH. He then went back to work for Babcock Lumber in Hubbard, OH, and retired again in 1997. Mort was a member of First United Methodist Church in Greenville, where he served as a trustee and was named man of the year in 2018. He enjoyed woodworking, reading, gardening, spending time with his children and grandchildren, and traveling, especially to Maine. Mort is survived by his wife, Jo-Anne (Owens) Cooper. They were married on June 18, 1955. Also surviving are: two sons, Robert E. Cooper, Jr., and his wife, Mary Louise, of State College, PA, and Glen Lawrence "Larry" Cooper, and his wife, Lisa Marie, of Harrison City, PA; one daughter, Jodi Michelle Cooper, and her partner, William F. Astle, of Martinsburg, WV; six grandchildren, Matthew James Cooper of Philadelphia, PA, William Emmett Cooper of Hoboken, NJ, Christine Louise Cooper of San Francisco, CA, Sara Aileen Gintert, and her husband, David, of South Riding, VA, Molly Ann Cooper, and her fiancé, Nathan Stewart, of Mechanicsburg, PA, and Delaney A. Cooper of Harrison City, PA; one great-granddaughter, Kennedy Cooper Gintert; sister, Patricia A. Thompson of Lebanon, OH; sister-in-law, Janet Cooper of Greenville, PA; and several loving nieces and nephews. In addition to his parents, he was preceded in death by: two brothers, James J. Cooper and William Cooper, brother-in-law, Jack Thompson, and sister-in-law, June Cooper. Visitation will be held on Thursday, February 7, 2019, from 4:00 pm - 7:00 pm at Osborne-Williams Funeral Home & Cremation Services, Inc., 73-75 Columbia Ave., Greenville. A funeral service with committal prayers will be held at First United Methodist Church, 73 Clinton St., Greenville, at 11:00 am on Friday, February 8, 2019, with Pastor Laurajane Stone of the church, officiating, and military honors presented by the Greenville American Legion. A visitation will be held at the church prior to the service from 10:00 am - 10:45 am. A private burial will be held at Shenango Valley Cemetery, Greenville, PA.
Memorial contributions can be made to: First United Methodist Church, 73 Clinton St., Greenville, PA 16125. Messages of sympathy, stories, and photos can be shared at: www.osborne-williams.com. To send flowers or a remembrance gift to the family of Robert E. "Mort" Cooper, Sr., please visit our Tribute Store. "Email Address" would like to share the life celebration of Robert E. "Mort" Cooper, Sr.. Click on the "link" to go to share a favorite memory or leave a condolence message for the family.